Click here to view historic sales data for Colorado Springs. Scroll down to view the latest listings in Colorado Springs. Colorado Springs is one of the most beautiful cities in the nation. Located at an altitude of 6,035 feet above sea level at the foot of Pikes Peak, the Springs offers convenient access to the Rocky Mountains, a variety of homes at every price range, and a community ranked as the third most health-conscious in the nation. Founded in 1871, Colorado Springs has enjoyed a rich history that has led to diverse neighborhoods offering a variety of homes for every price range. From the extravagant selection around the Broadmoor to the classic charm of Old Colorado City and Manitou Springs, El Paso County provides an abundance of beautiful homes and amenities to compliment them. Several nearby military installations, including Fort Carson, Peterson Air Force Base, and the Air Force Academy, make up a large portion of the local population. Shifting occupational trends over the past twenty years have made Colorado Springs a melting pot of residents with a variety of backgrounds and cultural influences, meaning that there's something for everyone in the city. The tech, health care, and retail sectors have made a significant impact on local business, but employment is growing in almost every industry. The climate in Colorado Springs varies greatly throughout the year. The average high and low temperatures in January are 43°F and 18­°F, while the average highs and lows in July are 85°F and 57°F. Around 16.6 inches of rain and 39 inches of snow fall annually. March brings the highest amount of snow, at an average of 8 inches, while August brings the most rain, averaging 3.35 inches. For anyone seeking a more mountainous climate, the western portion of the city is built up into the foothills of the Rocky Mountains and offers stunning views of the entire Front Range. Those looking for open lands can find their perfect living space just east of the city where ranches and farmlands abound. An assortment of shops, restaurants, and breweries can be visited all over the city, ranging from the energetic nightlife downtown to the sophisticated Shops at Briargate. The Cheyenne Mountain Zoo, ranked the 6th best zoo in the nation, offers amazing views of both wildlife and the city. The critically-acclaimed Fine Arts Center features year-round changing exhibits and a permanent, locally-based collection. Additionally, the Olympic Training Center and Olympic Committee Headquarters have led to Colorado Springs being nicknamed Olympic City, USA. The history of the Olympics can be explored at the US Olympic Museum, while events are frequently held at the Velodrome and World Arena Ice Hall. Mountain adventure sites include the Cave of the Winds, the Manitou Cliff Dwellings, and Garden of the Gods where the city's natural beauty can be experienced through rock climbing, mountain biking, or just a casual stroll. While all of Colorado Springs can be taken in at once from the top of the Manitou Incline, the summit of Pikes Peak offers the best view of the Front Range and can be reached through a drive up the Pikes Peak Highway, a hike up Barr Trail, or a ride on the Cog Railway. For those interested in the history of the region, remnants of the past can be studied at the Pioneers Museum downtown, at the Western Museum of Mining and Industry near the North Gate of the Air Force Academy, or up in the mining towns of Cripple Creek and Victor located just west of the city. The Pikes Peak Library District operates fourteen facilities and offers free online resources and a mobile library service. Three city-run community centers offer a variety of programs to enrich nearby neighborhoods, while the city Department of Parks and Recreation maintains over 9,000 acres of parkland and 500 acres of trails. El Paso County is home to seventeen school districts, including Academy School District 20 which serves all ages of students in the community through traditional and online classrooms and remains the highest achieving large school district in Colorado. 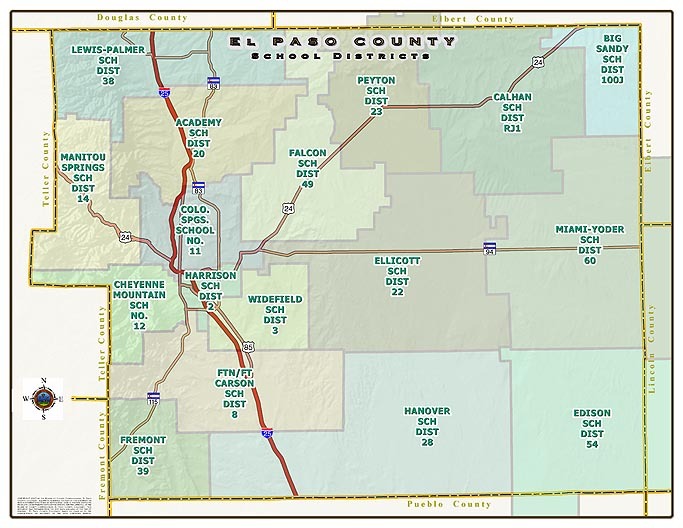 Picture from http://www.elpasoco.com/Residents/Pages/Education.aspx. Based on information from the Pikes Peak REALTOR® Services Corp. ("RSC"), for the month stated above. RSC does not guarantee or is in any way responsible for its accuracy. Data maintained by RSC may not reflect all real estate activity in the market.